Few things happened on Thursday..started normally with the recitation of Surah Yaasin separately by the Upper Primary Level in the hall and the Lower Primary Level at their respective classes...and ofcourse led by the teachers. 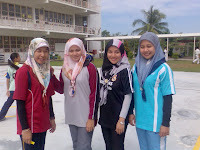 Netball team had their practice today for few times; early in the morning, during the recess & after the recesS. Ofcourse we aiming for something big for their match on Saturday 16th August. Wish you the best, girls! Here's photo of the coachs & import players... as i've posted the netball players before..so, now its coachs turn! Keep the ball rolling!! There was also this Demonstration for Cara-Cara Penanaman Pokok Buah-Buahan Tempatan done by Cikgu Zian & Cikgu Nani (assisted by Maci' Linda) at the openspace near the jetty (??). Demo was attended by more than 40 selected Ss (click here for more details...). I love this, the ability for teachers to have their own fruit tree! I hope we start learning and doing the same here in Egypt.